Melbourne-based design firm Studio 505 is known for its eco-friendly buildings and complex, richly-textured facades. The firm recently designed the Pixel Building, a colorful, zero-energy building that looks pixelated from afar, and the Delta Tower, a carbon-neutral tower made largely of wood. 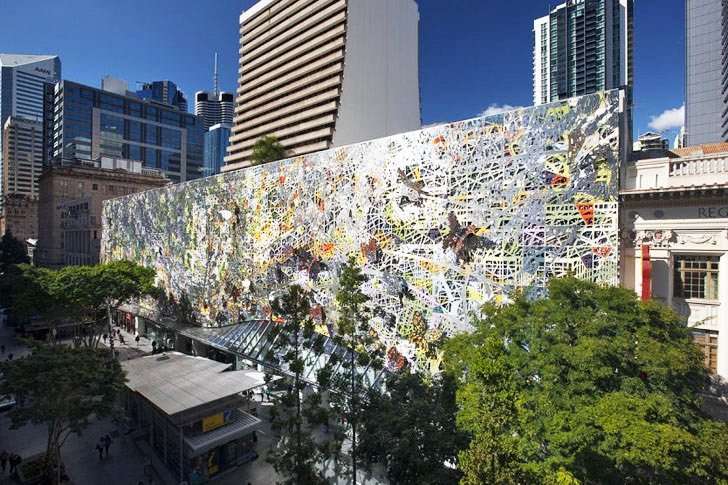 Now, the Australian firm has completed another ambitious project that involved adding a brightly colored, multi-layered facade to a Brisbane shopping mall that was inspired by the shadows and geometries found in nature. The 43,000-square-foot Wintergarden Façade features a complex new steel screen with a web-like structure. The team describes the pastel-colored facade as “a study of nature, geometry and layering that communicates the rich diversity of life.” And indeed it is. Viewed in the context of nearby trees, the intersecting lines on the facade appear to resemble the complex shadows created by tree branches. Taking the nature theme a step further, Studio 505 added several large steel butterflies to the facade, adding some depth to the sculptural building. “Every panel and layer in the 4,000m2 façade has a unique design that is fully expressed through the dynamic, experiential interplay between a considered but expansive palette of colours and a rich language of cutting, scoring, folding and lighting all of which coalesce as a rich, coherent, cultural experience,” explains Studio 505 on its website. The complex structure of the facade is composed of four layers — three separate layers of cladding and one layer of still grillage — which are attached to a large steel frame on the building’s exterior. The outermost cladding layer of stainless steel was laser cut for precision and hand folded. 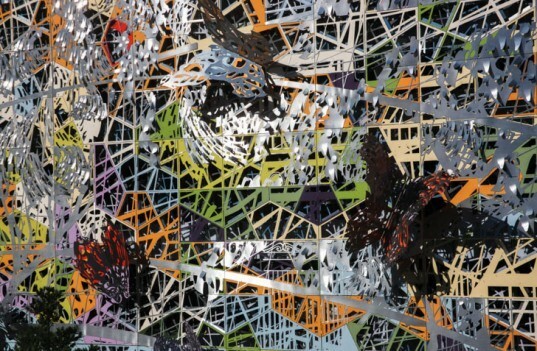 According to the architects, the resulting pattern isn’t a direct representation of a particular plant or natural system; instead, it’s an abstract work whose exact meaning is intentionally ambiguous. The 43,000-square-foot Wintergarden Façade features a complex new steel screen with a web-like structure. The team describes the pastel-colored facade as "a study of nature, geometry and layering that communicates the rich diversity of life." Taking the nature theme a step further, Studio 505 added several large steel butterflies to the facade, adding some depth to the sculptural building. Viewed in the context of nearby trees, the intersecting lines on the facade appear to resemble the complex shadows created by tree branches. At night, the new facade is lit up, creating an entirely different experience. The complex structure of the facade is composed of four layers -- three separate layers of cladding and one layer of still grillage -- which are attached to a large steel frame on the building's exterior.